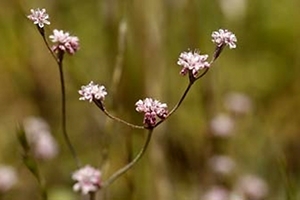 The Mount Diablo buckwheat, thought to be extinct, was rediscovered in 2005. Photo: Scott Hein / Save Mount Diablo. This week, QUEST’s Science on the SPOT video will feature the Franciscan manzanita, a plant thought to be extinct until it was rediscovered in San Francisco’s Presidio in 2009. The Franciscan manzanita (Arctostaphylos franciscana) is not the only California plant deemed extinct and then rediscovered. My friend Mike Park, a grad student in Integrative Biology at Berkeley, rediscovered the Mount Diablo buckwheat (Eriogonum truncatum) while hiking in Mount Diablo State Park in 2005. Mike was able to identify the plant thanks to its pale pink flowers, which were in full bloom; the species hadn’t been seen since 1936.Eight additional California plant species, listed as extinct in 1994, have since been re-found, including the fantastically-named Ventura marsh milk-vetch (Astragalus pycnostachyus var. lanosissimus), the northern adder’s-tongue (Ophioglossum pusillum), and the water howellia (Howellia aquatilis). It can be hard to determine whether a species is truly extinct. The difference between exceedingly rare and really extinct can rest on the lives of just a few individuals. The California Native Plant Society (CNPS) keeps track of plants that are likely extinct in the Online Inventory of Rare, Threatened and Endangered Plants of California. The list of plants thought to be extinct tells the story of land use change in California over the past 150 years. For each of the 29 plants, the possible reasons for extinction are listed: urbanization, conversion of river banks to agricultural areas, wetland modification, mining. Plants with distributions that were confined to the Channel Islands seem particularly vulnerable to extinction. For some plants, like the lost thistle (Cirsium praeteriens), it isn’t clear whether they were California species that went extinct soon after they were first described, or recently introduced European plants that failed to establish in the New World. Many plants on the list, like the hairless popcorn flower (Plagiobothrys glaber), may still be out there in small numbers, but we just don’t know. To find out whether the plants on the extinct list are really alive and blooming (and whether the plants on the rare list should be shifted to the extinct list), CNPS has started the Rare Plant Treasure Hunt. They match amateur plant hunters with experienced botanists, and provide detailed maps of priority areas and info on plant identification. This is a great project for school clubs, scout groups, and anyone interested in doing some botanizing. And they’re particularly interested in recruiting people with GIS skills (geocaching enthusiasts, that’s you!). Just because a plant hasn’t been seen in decades doesn’t mean it’s gone forever. It might be growing at your feet; you just need to know what to look for.